When you’re on the Whole30, desserts and snacks are off limits. Removing certain food groups (sugar, gluten, grains, dairy, alcohol and legumes) is just as important as re-training the way your brain and stomach communicate so that everything is working the best way possible. No sugar wasn’t too bad since we’ve been in the process of quitting sugar anyway. We followed the no-snacks and no-dessert rule pretty strict. Anytime the kids had a “snack” it was actually a mini-meal, and there was fruit at the dinner table to satisfy that “sweet” craving after our meal. The only time I broke the rule was on Easter Sunday, when my good friend Katie visited with her family. On that day, I busted out avocado chocolate pudding cups and this no-bake coconut blueberry pie recipe. And I don’t regret it for one moment. It was a special occasion AND we had company… and despite the fact that it was technically dessert, we served it as soon as dinner was over AND the ingredients are entirely Whole30 compliant. There’s also no baking involved either, but that’s just a perk! You’d think that this no-bake coconut blueberry pie would be have no taste, given the lack of ingredients we usually think of when it comes to dessert (i.e. sugar, butter and flour in homemade chocolate cake or pumpkin cookies with cream cheese icing or even healthy sugar cookies), but it’s quite the opposite – this dessert is a flavor bomb! My famous homemade pie crust consists of flour, butter and a smidgen of milk. All three of which are a no-go on the Whole30. I still wanted that defined “crust,” so I used whole almonds and dates. 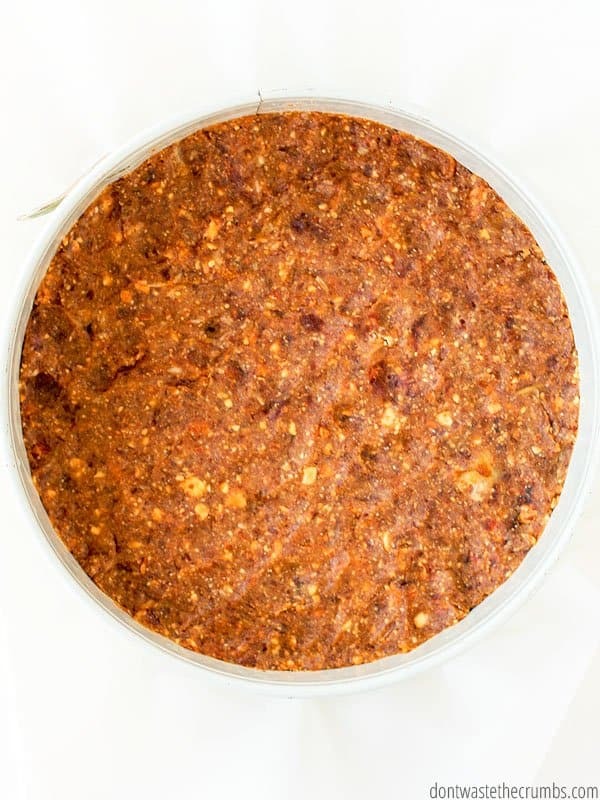 Once the almonds are put through a food processor or blender, they become a combination of almond flour and finely chopped almonds. Add the dates to the mix and you get what looks like a huge ball of sticky almonds… But this sticky ball is malleable, and can be pushed down into the bottom of your springform pan to make a lovely crust. It also hardens in the fridge, making it more “crust-like” than soft ball of dates. Which Coconut Milk Should You Buy For the Filling? I tested more cans of coconut milk than I could count trying to perfect this recipe, so take note of my cautions. First, you need canned coconut milk. The coconut milk you find in the dairy case by the regular milk will not work. Second, your canned coconut milk should have these ingredients, in this order: coconut, water, guar gum. If you can find coconut milk without guar gum, that’s awesome because it’s one less additive you’re eating. You DON’T want is coconut extract or coconut milk to be listed as an ingredient. Once you find the right coconut milk, put it in the fridge for at least 24 hours. The longer the better really, because as it sits, the coconut solids will separate from the water and rise to the top of the can. These solids are called coconut cream and they MUST rise to the top and become a solid in order to make the filling for the pie. 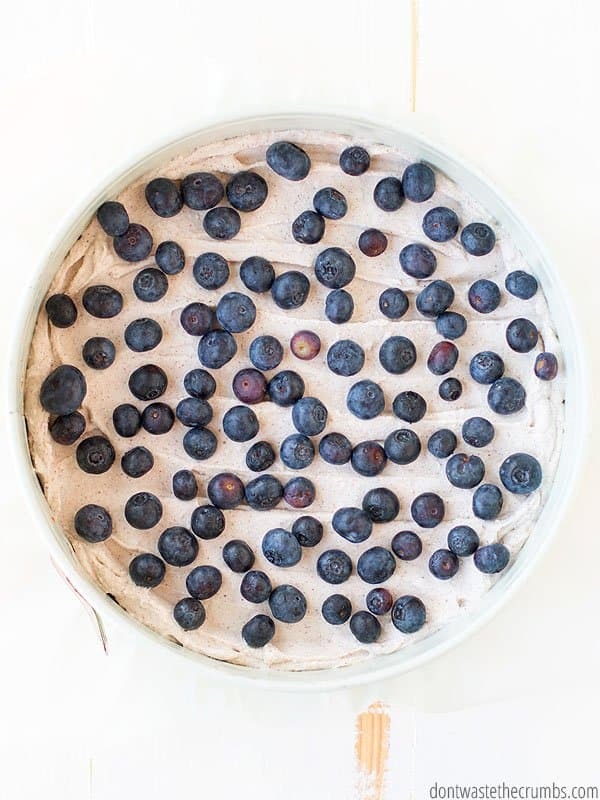 If you just went to the store and you’re hankering for this no-bake coconut blueberry pie, I’m so sorry. Please put your cans of coconut milk in the fridge and patiently wait until tomorrow. Or preferably, the next day. I forget where I saw this, but here’s the best way to get coconut cream out of the can. Remove the can from the fridge. Open the can with a can opener. Pour out the water from the can. Scoop out the coconut cream with a spoon or spatula. I’ve tried it the other way – where you open the can from the top and scoop until you reach the liquid – but you sometimes scoop out water with the solids when you use that method… and you certainly don’t want the liquid in this recipe! Opening the can upside is a game changer – I’ll never go back! The filling is nothing more that whipped coconut cream. To make whipped coconut cream, you put the coconut solids (and no liquids) in the bowl of a stand mixer. Attach the whisk, turn the speed up to high and let it whip for 3-5 minutes. The whipped coconut cream is ready when you pull the whisk through the cream and it leaves a clear line and the coconut does not fill in on itself. I added vanilla powder for a bit of extra flavor, but it’s not necessary. You can’t have vanilla extract on the Whole30, so I have not tested making whipped coconut cream with it. I personally wouldn’t recommend it, if anything, because the additional liquid might interfere with whipping the coconut cream. 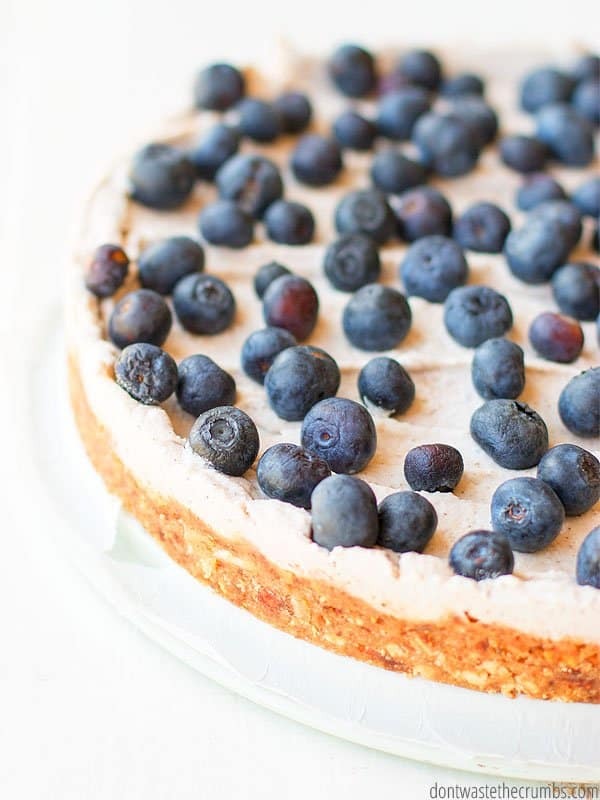 I kept the topping super simple: fresh blueberries. I added a smidgen of shredded coconut for the sake of pretty pictures, but you don’t have to do that if you don’t want to. For that matter, you don’t even have to use blueberries if you don’t want to… fresh strawberries, blackberries or raspberries would all work. 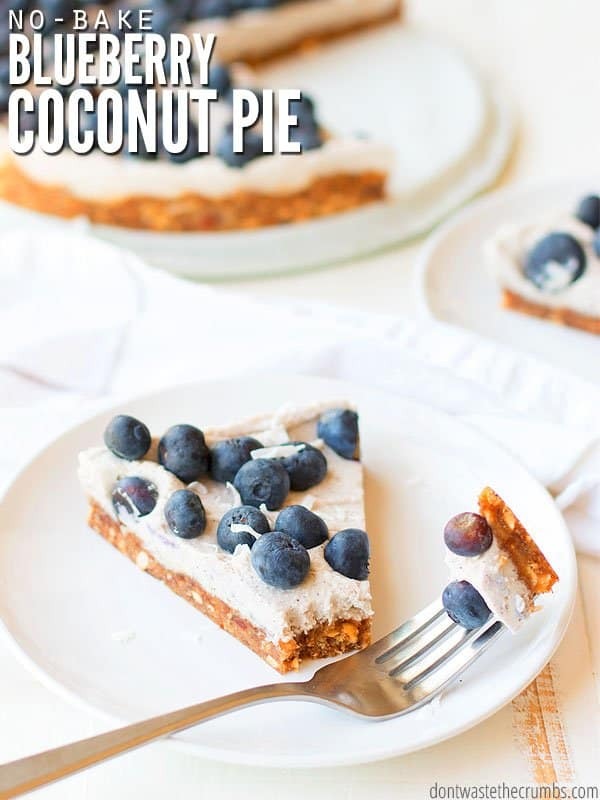 Granted, it wouldn’t be a coconut blueberry pie anymore, but it would still be amazing! Please read this recipe through all the way before you start making it. The coconut milk needs to be refrigerated, the crust needs to be refrigerated and the entire pie needs to be refrigerated. The timing of all of this should be taken into account before you dig in. This pie keeps well in the fridge for 2-3 days. I’m sure it can last 4, but my family eats the entire thing well before then! To cut, I recommend using a sharp knife. Run the knife through water before slicing to help get a clean cut. You can freeze the pie to speed up the process. The first time I made this pie, it was just a few hours before Easter dinner. I put the pie in the freezer to speed up the cooling and solidifying process and it worked, but the filling was more icey than creamy. It wasn’t bad, just different. If you’re short on time, the freezer can work in a pinch. The cost of the dates prevent this recipe from being super frugal… but if you’re on a restricted diet, sometimes its worth the splurge to feel like you can eat normal again. Coconut Blueberry Pie is an allergy friendly dessert, perfect for celebrating any occasion. Get a perfectly round pie that’s easy to slice with a springform pan like this one. Blend up your almonds and dates in a food processor or high-powered blender to get the best consistency. Don’t end up with a “coconut milk emergency” and keep a can of this type of coconut milk in your fridge. If blueberries aren’t in season, use a different seasonal fruit to save money and try new flavors! While ingredients like almonds and dates aren’t typically frugal, you CAN stock your real food pantry with healthy options like these with the techniques learned in Grocery Budget Bootcamp! This recipe requires the canned coconut milk to be refrigerated for at least 24 hours BEFORE starting. The pie itself requires at least 2 hours of cooling in the fridge. Please keep this in mind before you begin. Prepare your pan: Line an 8-9" springform pan with parchment paper. Put the ring on the base and tighten. In a food process or blender (I used my Blendtec with the four-sided jar), place whole almonds and quartered dates. If your almonds are unsalted, add just a pinch of salt, if desired. Pulse until the almonds are finely chopped and the dates are no longer in large chunks. This took several rounds in my Blendtec and I ended up with a large ball of mashed dates and almonds. This is normal. Put the almond date mixture into the bottom of the lined springform pan. Using wet knuckles, push the mixture to the outer edges of the pan, doing your best to make an even layer of crust. Re-wet your knuckles as kneeded. Put the crust in the fridge as you prepare the filling. Remove the cans of coconut milk from the refrigerator. Turn them upside down, open them with a can opener and pour out the water. Use a spoon and/or spatula to get ALL of the remaining solid (coconut cream) from the can and place it in the base of a stand mixer. Add the vanilla powder, if using. Using the whisk attachment, turn the mixer on high and whip the coconut cream for 3-5 minutes. The coconut cream is done when you can make a line through the cream with the attachment and the coconut cream does not fold in on itself. Remove the crust from the fridge. 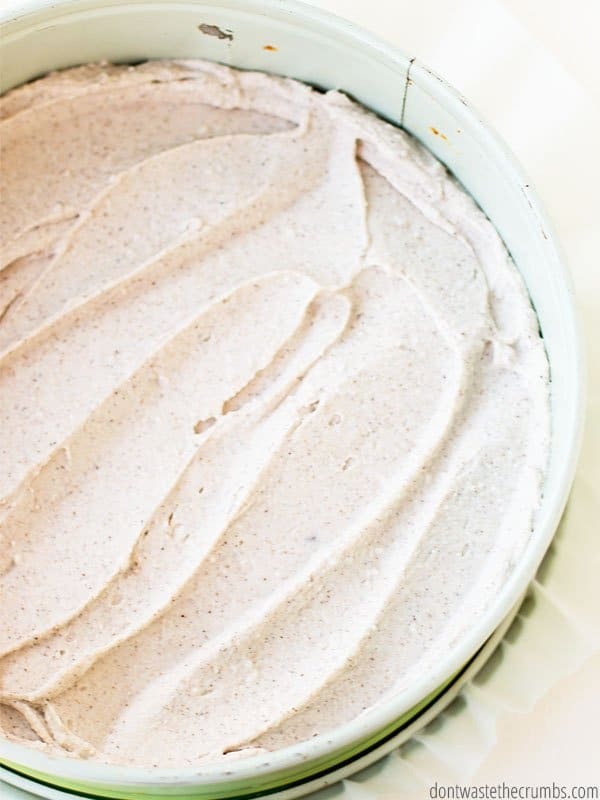 Using a spatula, very gently spread the whipped coconut cream evenly over the crust. Top with fresh blueberries and place in the fridge to set for at least 2 hours. Cut and serve, storing the pie in the fridge. * You need 15 dates for this recipe, but my 12 oz package came with 20. You can either use all 20 dates in this recipe, or use the remaining 5 dates for something else. ** See notes for choosing the right coconut milk. 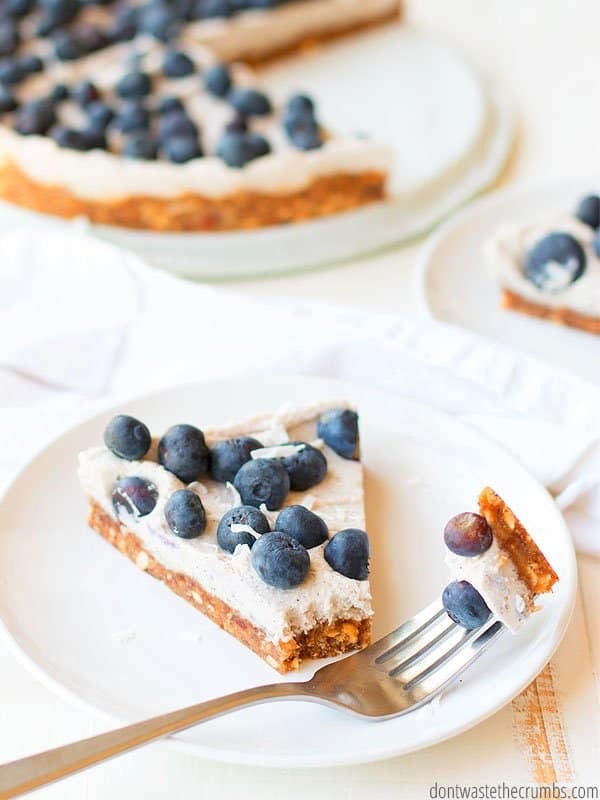 Do you have any healthy dessert ideas? Specifically, any that don’t include sugar? I’d love to hear them in the comments below! I made this for mother’s day, so easy and it was a hit!! I’m going to try it with raspberries next time I make it. Thanks so much ! This is a fantastic recipe! I made it yesterday for some company and every loved it and couldn’t believe there was no sugar in it! I’m so glad you all enjoyed it!! Any ideas on substitutions for the dates? I don’t. Another similar texture fruit perhaps, like prunes? But that would dramatically change the flavor. Could I just use coconut cream out of a pack? You know, it comes in those little pouches, would that work as well? I’ve never seen coconut cream in a pouch before, but I’ve seen it in a can. Even in a can, there’s still a good bit of liquid. Definitely refrigerate because that liquid means your pie won’t get completely solid. Hi again! Ah I think I know where I got confused. I meant ‘creamed coconut’ (example here: https://www.tesco.com/groceries/en-GB/products/250490888), do you know if it’s similar? It definitely not liquid. Thank you in advance! Hi! I haven’t tried that before, so I’m not sure… BUT, if it’s not liquid, it’s worth a shot! I’d empty a packet out into a jar, then put the jar into the fridge! If I don’t have a stand mixer would a hand mixer be okay? Just put on high for 3-4 minutes? This was great and I’m not even the biggest coconut fan. Next time I make it, I’ll make a thicker crust. I think it needs more. Thanks so much for sharing this. Made this today! My coconut cream froze on top 🤦🏼‍♀️ So i don’t think my consistency will be quite right, but it tasted delicious! I used blueberries and raspberries and Used pecans instead of almonds in the crust. Next time i want to add a layer of bananas between the crust and filling for a banana coconut cream pie! Ooh – the idea of bananas sounds really good! I’ve done something similar with the freezing, but it all tastes good in the end!